In all of my thinking and planning for the A to Z Challenge, I have found that C is a pretty easy letter to work with. Almost too easy – you end up with too many things to choose from. There are a few letters like that. And maybe why I’m thinking about it is because today’s topic matches what my wife and I are doing on Comparative Geeks: we’re going A to Z characters. When it comes to writing, though, characters are kings. Even in non-fictional pieces, the subject of the piece often ends up as the character, as we get the history, or current goings-on. Maybe not fully anthropomorphized, but getting there. But when you get to fiction, a story needs its characters, perhaps even more than those characters need a story. I’ve read absurdist literature. It’s doable. I do a lot of my thinking and writing about Science Fiction, and Fantasy, and it can be easy to get carried away with these sorts of genres… lost in ideas, in world-building, in all of those sorts of gritty details to make the world seem right. Carried away too much, and the characters fall flat, and the reader ends up unengaged. You want a story your reader can get lost in… but for whatever reason, it’s through the exploration and experiences of the characters that we get lost. Which means the most common sort of character is the one that is a stand-in for the audience, or the one who is new to the world being presented. Whether it’s just the new guy or rookie, or the Connecticut Yankee in King Arthur’s court, this character is essential. You don’t want to make them too blank – this is actually something that happens a lot in video games. To give the player the control of the situation, to feel like they are this blank slate character, the character does not speak throughout the game themselves. I think the Nintendo games especially have a lot of this – Link never really gets any lines in the Zelda games! But even, think of non-fiction, or better yet – think of political speeches. They always seem to reach a point where they need to personalize it, where they have to bring up some real (probably) people in a real place, experiencing whatever it is they’re talking about. They can give you facts and ideology all day, but they give you that character to latch on to as well. Because let’s face it – characters are a fundamental to stories. The last couple of weeks I have reblogged my posts on the definition of Fantasy and of Science Fiction. In this post, I put those definitions to the test! This is an age-old geeky/nerdy question, as to which is better, or which is what, and I think now I am at a place where I can weigh in. Because both have a huge fandom around them, both have TV shows and movies and different eras and books and video games and… on what grounds do you compare these two worlds? I have at least one way I would like to compare them. I recently did a post on the definition of Science Fiction – and one on the definition of Fantasy. I am going to be relying heavily on these definitions, as I think that weighing these will show a difference you can discuss between these two series. 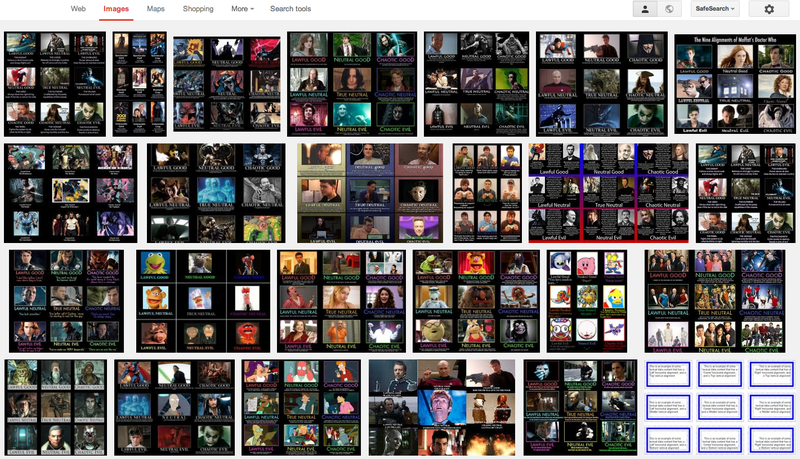 This is a screenshot of the first few lines of Google Image results for the term – The Nine Alignments. I come up twice from comparativegeeks.wordpress.com! So here’s some more evidence that something we’re doing is working – over on Comparative Geeks. Time to check in on the experiment I have had going on these last weeks. So what has the last month looked like? I am also not seeing any search terms that turned these posts up, although with 6 views, that’s not surprising. This experiment is intriguing in that it’s not turning anything up here in the slightest. Also: frustrating. I had said that the next experiment was the photos with the tags, so here we go! So last week, I did a re-blog of a list I had written, but I used the PressThis share feature, and that really does not give you much to work with as far as a post. It’s basically a one-liner link. I think you should check it out, it’s a good list of epic scifi and fantasy series. This week, I will try to use this again, only this time by adding this text, and we’ll see how that works. As explanation, this post was called The Hero’s Progress, and it was a theory based on plots and how we overuse some. Also check out the one I link to early on, my wife’s post about the recent controversies about the Damsel in Distress trope. If you’re writing, think twice before falling for: The Hero’s Progress. Well, we’re a week on, how did my last experiment go? Comparative Geeks: Character Studies Truncated: 7 views this week. 3 total “likes” on WordPress, not all this week. dbcii: Something About This Worked: 3 views this week. 17 total “likes” on WordPress, all this week. Well, those are some very different stats. So what does this mean? And what’s the next experiment? Read on! So, after thinking about all the various things that are working in my blogging right now, that got me thinking about my most successful post on Comparative Geeks. It just keeps getting found on the Internet, and keeps getting views. I mentioned it in my last post. And it had such an odd name. I mean, what I was referencing was my previous post, in which I had laid out a plan to explore each D&D alignment and painstakingly go through and place various fictional characters within them. Which seems tedious and pointless once you start looking for this sort of stuff on the Internet… Because there’s, like, a lot of that out there. The other day, my laptop tried to tell me that my video card was no longer supported for Diablo 3. Now, I have an old PC (from 2006). I worked on trying to upgrade some of it, and I fried my graphics card trying to do so. So I stopped messing with that, and, seeing how well my wife’s stuff worked, started buying Macs. Now I have a MacBook Pro, an iPad, and an iPhone. They work great together, and my life has started working well in terms of starting my ideas on my iPhone as I go, and then expanding on them and organizing on my iPad, and then finally doing my composition on my laptop. Oh, and an Apple TV for connecting with these devices for watching YouTube and Hulu and such from the TV.